Hi everyone~this is a project that I did for Epiphany Crafts. It was on their blog a couple of days ago. I really enjoyed doing this. I love the saying~kinda of my motto right now. Another gift from The Soul Restoration class I took with Melody Ross. I used the EC 14 rd button on this project. 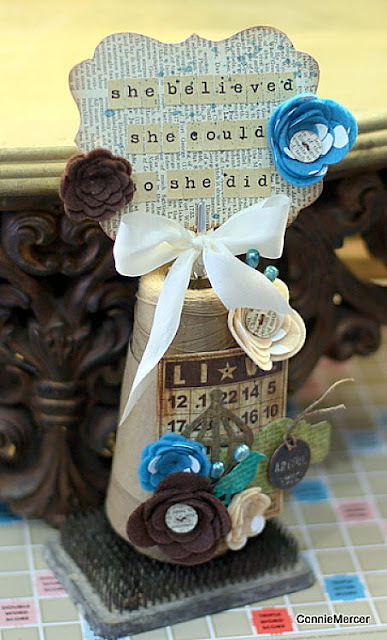 Rumor has it some new shapes are coming soon from Epiphany Crafts~so cool!!!! The flowers are felt and I cut them out using a Sizzix die. The bird cage is Tim Holtz, bingo card Jenni Bowlin. I crackled the bingo card using Helmar's Crackle med. Great stuff!!! The lettering is by October Afternoon~Have a great weekend and I'll see ya on Monday! That is so my motto, too! Believe is my favorite word! oooo this is gorgeous!!! and I love the sentiment!